Senlin Ascends by Josiah Bancroft. Orbit, 2017. Paperback. 448 pages. What a brilliant book! Senlin Ascends is action-packed with a surprise on each page, and I had a really hard time putting this one down. In the acknowledgements sections, Bancroft states that "If you know anything about my books, chances are you have Mark Lawrence to thank for it," and, well, pretty much! I first heard about this book from Mark Lawrence in 2016 (?) 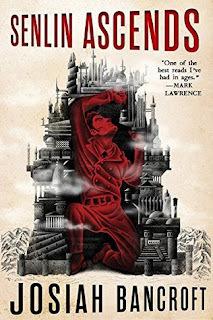 during his SPFBO contest and added it to my 'to-read'list because of how great it sounded and, well, it's sort of languished there every since. Orbit is now publishing it this month and the hype around this book has grown so much. After seeing Mark Lawrence continuously praise it and encourage everyone to read it, Orbit sent me over a copy and I picked it up right away--and it was amazing! This book is so cleverly and carefully created. This is the story of Thomas Senlin, a headmaster in the small town of Ur, as he and his wife journey to the magnificent Tower of Babel to spend their honeymoon there together. Unfortunately, Senlin inadvertently loses his wife in the outskirts of the Tower, and must begin his own journey up the Tower on his own to find her and bring her home. The craziest--and coolest--part of this book, obviously, is the Tower of Babel itself, an extremely tall building of sorts with various 'ringdoms' making up each tier of the tower. Each 'ringdom' is entirely different from the last and filled with any number unknown variables; it is entirely unpredictable, despite a handy book guide that Senlin has used to study the Tower for years that has turned out to be, well, not so handy. Senlin himself is a truly delightful, compelling protagonist that undergoes so much growth in this book in so many ways. He learns that you can't necessarily trust everyone, but that you have to trust some people. He learns that you can't always believe everything you read and hear. Senlin is a quick-witted, somewhat conservative figure that wants to experience many exciting things in his life, but he always cares about people and strives to be a good person. I love imaginative books like this that make up something so incredibly bizarre and use it in an inventive and entertaining manner. This book was filled with quirky, unique, and rather clever characters along the way, all of which brought something very useful and important to the story. I really liked that Bancroft not only included many details and characters, but that each and every aspect of his story was purposeful. There was nothing added in just to add length to the pages or expand unnecessarily. His world-building is really well-done and I loved cracking open this book to get whisked away into the wild world of the Tower. The only minor issue I had with this book was that the end felt a bit... jumbled and crazy and I felt a bit confused at times, but I'm not sure if that's just my fault for getting easily confused, so I don't really blame Bancroft for that. Rest assured, Senlin Ascends will not once bore you! From start to finish, Bancroft employs a simple yet also intricate method of storytelling that will completely draw you in and make you constantly yearn to know more about Senlin an the Tower of Babel itself. If you're looking for something unique, adventurous, witty, and imaginative--look no further, because you have arrived at your destination here at the Tower. Overall, I've given Senlin Ascends five stars! Never miss a post of bookish content by subscribing to Forever Lost in Literature! So glad you enjoyed this one, this is the first time I'm hearing of it. I'll have to check it out due to all of your praise!